Dementia patients in the UK face a "care tax" because they are left to sort out much of the care they need themselves, experts say. The Alzheimer's Society found that on average, the equivalent of £32,242 a year was spent on care per patient. But the researchers said on average only a third - £10,784 - came from NHS or council funds, leaving a shortfall. The charity said it was unfair as those with cancer or heart problems got their care free on the NHS. The research - carried out by the London School of Economics and Kings College London - was carried out to update figures compiled by the charity in 2007. Experts looked at care provided by the NHS and paid for by councils as well as the private care market and amount of unpaid support provided by family and friends. They found that caring for dementia patients cost the UK the equivalent of £26.3bn overall, but estimated that £17.4bn - two-thirds - came from private care services or in the form of unpaid care. For the individual, that works out at £32,242 a year - £21,322 of which was not from the state. Alzheimer's Society chief executive Jeremy Hughes said the figures were "staggering" and the lack of paid-for care was, in effect, a "dementia care tax". "If you have cancer or heart disease you can quite rightly expect that the care you need will be free. "That is just not the case for people with dementia. Families are forced to break the bank to pay for basic care for a loved one." Media captionA dementia sufferer’s carer and NHS England's dementia director comment on the Alzheimer Society's findings. 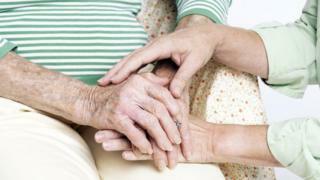 As well as the cost of care, researchers looked at the number of cases of dementia. They found that over the last seven years there had been no change in the proportion of older people getting the disease - it has stayed at 7.1% of over-65s. But they predicted the overall numbers would rise from 850,000 now to more than two million by 2051 because of the ageing population. The report said there had been a rise in younger adults with the disease - up from 17,000 to more than 40,000. But researchers said that rather than there having been a real increase, the previous study had underestimated the scale of the problem. Health Secretary Jeremy Hunt said the government was prioritising dementia care, pointing out the Prime Minister's dementia challenge was launched in 2012 to help improve care and research. Since it was launched diagnosis rates have started to rise, while investment has been made in services such as memory clinics. On top of that, from 2016 care costs will be capped at £72,000. "I want to make sure those with dementia, their families and carers get the help they need," he added. What is the NHS there for? How significant are developments in making Alzheimer's brain cells in the lab?